Injury to the accessory nerve during a neck dissection (ND) is perhaps the most morbid complication of an ND because of possibility of a late shoulder dysfunction due to the impaired innervation of the trapezius muscle. Ever since Bocca and Pignataro  in their landmark publication proposed the anatomic basis of accessory nerve preservation, several authors have proposed various methods to delineate the nerve during ND., It is hopefully expected that the current description based on the authors' personal experience further adds to the existing precision of surgical identification of the nerve. Accessory  nerve identification and preservation during a comprehensive ND is a tedious procedure with a relatively slow learning curve for the beginner. Based on an experience with more than 700 NDs in a tertiary referral cancer care center over a period of 15 years, the author proposes a few technical points and highlights a crucial surgical identifying feature of the terminal course of the accessory nerve, which will facilitate learning of the technique of functional preservation of the accessory nerve in the neck. After identification of the upper course of the nerve between the internal jugular vein and posterior belly of digastric, it is traced posterolaterally to the submuscular recess of the sternocleidomastoid (SCM) taking care to preserve at least one of its communications with the cervical plexus, to enhance the motor functions of the nerve wherever possible. 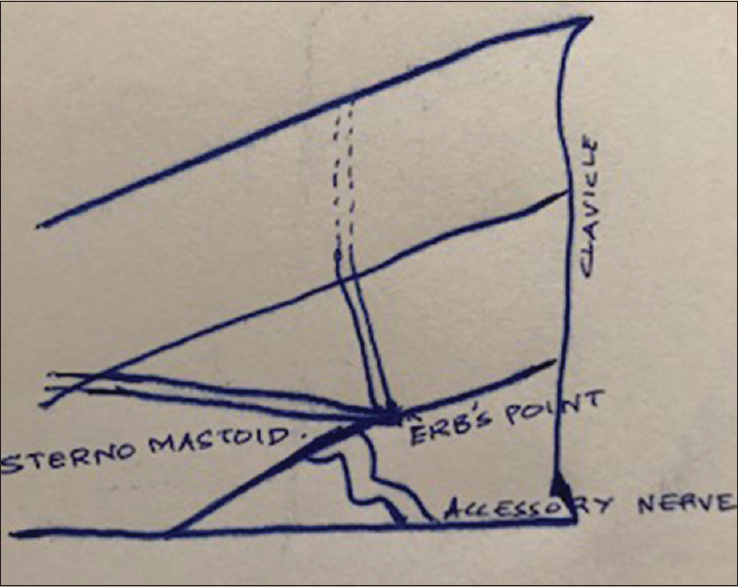 Roughly at this segment, the nerve gives off a branch superficially to the SCM and then runs in its substance to exit at the Erb's point  into the posterior triangle. In this course, it has a characteristic coiling or kinking appearance, and it burrows it into the trapezius muscle along with the transverse cervical vessels [Figure 1]. In the author's opinion, this “telephone wire appearance” [Figure 2] and [Figure 3] is an absolute identifying feature of the trapezius branch of the accessory nerve which is hitherto unreported in the English literature. Among the three nonlymph-bearing structures that can be spared in a modified ND, the most important and crucial from a functional point of view is the accessory nerve. The important landmarks to identify the nerve during an ND include the digastric muscle, internal jugular vein, transverse process of C2 vertebra, the vein accompanying the accessory nerve, constant communications from the cervical plexus to the accessory nerve, and the Erb's point from where the cutaneous nerves exit from the posterior border of the SCM., Although there have been several descriptions of the surgical anatomy of the accessory nerve and methods to identify and preserve it during an ND, the present technique of relying on the “telephone wire appearance” as a constant feature of the nerve in the posterior triangle has not been reported in the English literature. This distinct coiling of the nerve is perhaps to accommodate for the neck (rotation and extension) and shoulder (shrugging) movements facilitated by it. The current treatment guidelines  envisage that the nerve has to be preserved during all NDs, except in those situations where extracapsular spread of an adjacent node causes an infiltration to it. Nevertheless, the nerve is vulnerable to injury in the posterior triangle, and it can occur even during simple procedures such as a lymph node biopsy. Avoidance of injury is best achieved by banking on the anatomical characteristic of the nerve described in this paper, which has not been recognized as an identifying feature so far. Jones TA, Stell PM. 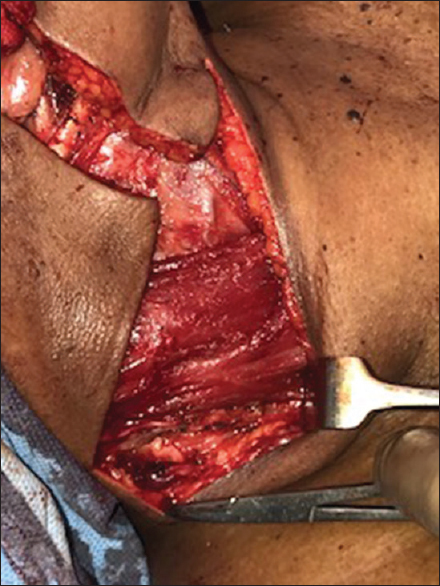 The preservation of shoulder function after radical neck dissection. Clin Otolaryngol Allied Sci 1985;10:89-92. Bocca E, Pignataro O. A conservation technique in radical neck dissection. Ann Otol Rhinol Laryngol 1967;76:975-87. Lloyd S. Accessory nerve: Anatomy and surgical identification. J Laryngol Otol 2007;121:1118-25. Chaukar DA, Pai A, D'Cruz AK. A technique to identify and preserve the spinal accessory nerve during neck dissection. J Laryngol Otol 2006;120:494-6. Salgarelli AC, Landini B, Bellini P, Multinu A, Consolo U, Collini M, et al. A simple method of identifying the spinal accessory nerve in modified radical neck dissection: Anatomic study and clinical implications for resident training. Oral Maxillofac Surg 2009;13:69-72. Coskun HH, Medina JE, Robbins KT, Silver CE, Strojan P, Teymoortash A, et al. Current philosophy in the surgical management of neck metastases for head and neck squamous cell carcinoma. Head Neck 2015;37:915-26.